Come and see the nightlight on the Kepler Track and discover a different side to the forest! Join DOC rangers as they wander through the forest listening for nightlife and uncovering creatures of the dark. 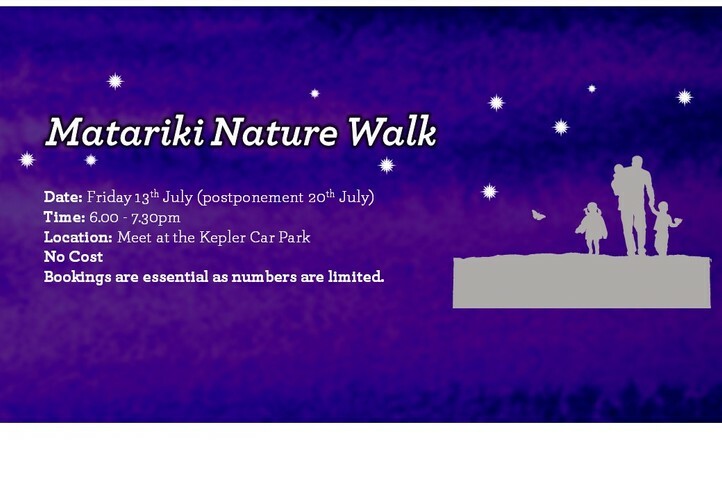 Meet at the Kepler Track carpark at 6pm, then head off towards Rainbow Reach or Brod Bay with our rangers as they show you the magic in exploring this well-loved Great Walk at night. Enjoy a hot chocolate at the end and share stories about your adventure in the dark. Please bring lots of warm clothes, sturdy boots, a head torch and a raincoat. Bookings are essential as numbers are limited, so don't miss out on this amazing evening under the stars and book your spot today! This event will be postponed to Friday 20th July if the weather is bad.